Are you looking for ways to increase efficiency and productivity? Find your 3D print solution! Our representatives have already helped many businesses on effective use of 3D printing in their field. This provides them comprehensive knowledge to provide tailored advice for your situation. Are you looking for a small investment with high return? Get a free consult now! "We increased our efficiency straight away!" 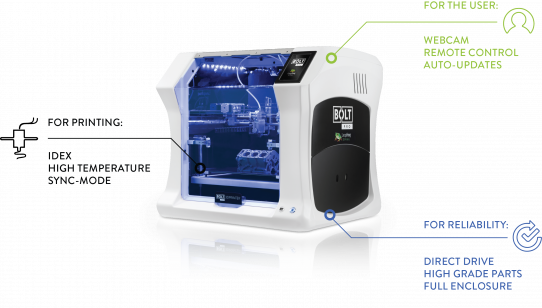 "By implementing the Bolt Pro 3D printer in multiple departments, we were able to get our investment back within a couple of months!" Leapfrog 3D Printers sets itselves apart by developing FDM 3D print machines of high grade materials. Longevity, durability and heavy use are the key points of any Leapfrog 3D printer product. Start a conversation with our representatives and start your 3D print revolution. GET YOUR PERSONAL SOLUTION NOW!